For those with a mind towards security, zero-knowledge encryption is the way to go. During this overview, we’ll be taking a look at two services that rank among the best zero-knowledge cloud storage options available today: Sync.com and MEGA. While Sync.com ranks as one of our best cloud storage picks year after year, MEGA probably gets a little more mention online. That’s partly do to its ties to Megaupload, seized by the FBI in 2012 for supporting online piracy. Mostly, it’s because MEGA lures users with an impressive 50GB of free cloud storage. At last count, MEGA had 50 million registered users. Sync.com, meanwhile, claims a bit over 250,000. That’s not quite the David and Goliath story that, for example, Sync.com vs Dropbox is, but its still probably enough to convince the casual observer that MEGA must be a better service than Sync.com. The short story is that it isn’t. The long story comes next, as we compare Sync.com and MEGA based on several key aspects of cloud storage. Don’t forget to check our our separate Sync.com review and MEGA review, too, or our video summary of this article. We decided to break this battle down based on four criteria: storage, sync, sharing and security. We feel these are the main aims of cloud storage and will break them down in four rounds. 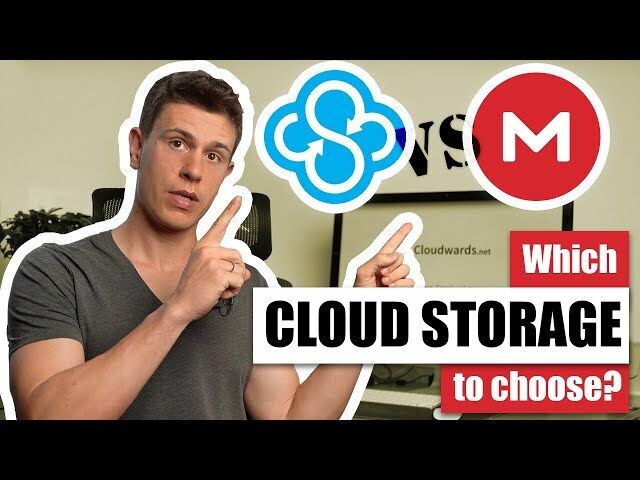 If you’re not sure what cloud storage is or how its different from online backup, feast your eyes on our backup vs storage rundown. In a nutshell, though, both Sync.com and MEGA let you extend beyond the storage capacity of your computer hard drive. That makes them ideal for people that take lots of pictures, that have a large digital music or movie collection or work as freelancers, among other things. Sync and sharing are add-ons to that goal, even if for some people those are more important features. There are services that are more geared towards sync and share, including some of those mentioned in our best EFSS roundup, but not Sync.com and MEGA. While storage, sync and sharing are all pretty commonplace, good cloud storage security is not. Sync.com and MEGA, however, both offer zero-knowledge encryption, which puts them in rare company and makes for a what we hope will be a compelling comparison. We’ll start with two very important factors in round one: gigabytes and dollars. Free storage, subscription costs and total storage are all on the table. You can get a pretty generous 5GB of free cloud storage with Sync.com. While you won’t have access to some features like advanced share features (see round three) and are limited to 30 days of versioning, that might be enough for some users. Sync.com also has a nice referral program that grants you 1GB per referral, with no maximum in place. The easiest way to get more storage is to subscriber to a higher tier plan, of which Sync.com has too: 500GB or 2TB. Both plans are more than fairly priced. Most of the mainstream services, including Google Drive and Dropbox, give you 1TB of storage for around $10 a month. Sync.com gives you twice that for $2 less. The addition of a 500GB plan is nice to see, too, since many cloud storage services don’t offer less than 1TB, forcing people to possibly pay for something they don’t need. About our only complaint is that you have to pay annually. There’s no month-to-month option. Most users of MEGA probably never pay a dime. That’s because MEGA gives you 50GB of storage for free, which is far and away the most you’ll get for free without lifting a finger. MEGA doesn’t have a referral program, so if you do need more you’ll need to look at a subscription. MEGA actually provides four different “Pro” subscription to choose from, starting with a 200GB plan and going up to an impressive 8TB of storage. The MEGA 1TB plan costs around that $10 mark we mentioned earlier that Google, Dropbox and a few other storage providers charge. While that’s not a great deal, MEGA has a 4TB plan that’s very competitively priced at around $20 per month. MEGA also lets you pay either monthly or annually. Pay for a whole year, and you get a slight discount. Sync.com has one of the best referral programs available. While MEGA doesn’t have a referral program at all, 50GB of free cloud storage is nothing to sneeze at. Both Sync.com and MEGA number among our best free cloud storage picks. When it comes to subscription plans, most people will likely find more value with Sync.com. Both providers have low-cost options. However, with Sync.com that’s 500GB of storage for $4 a month, while with MEGA you can get 200GB of storage for $5 a month. Sync.com’s 2TB plan is also cheaper than MEGA’s 1TB plan. Sync.com doesn’t have any plans over 2TB like MEGA does with its 4TB and 8TB option. However, most people just won’t need that much. 50GB of free storage is enough to make MEGA intriguing (at least on the surface) and round one close. That said, Sync.com’s 2TB plan ranks among the best deals in cloud storage, only matched by the 2TB pCloud plan for the same price. Short for device synchronization, sync is a feature that lets you access the same file on different devices without having to manually move it yourself. Most cloud storage services today sync files, including Sync.com and MEGA. When you install the Sync.com client on your computer, a sync folder is created in your file system. Any files you place in it are stored on both your computer hard drive and in the cloud. When you make changes to any file already in that folder, the corresponding file is updated in the cloud, and those changes are sent to any other synced devices if they’re online. The approach is nothing new; just about every cloud storage service does it this way. What’s key is how efficiently its done. To find out fast Sync.com moves files, we conducted a few file upload and download tests using a 1GB folder made up of various file types. These tests were performed over a WiFi network from SE Asia that had upload speeds of 10 Mbps and download speeds of 22 Mbps. Our test results are record in the table, below. Sixteen minutes might seem like a long time to wait for a file to upload, but hopefully you won’t often be working with uploads as large as what we tested. These results are in line with other top cloud storage options, in any case. Sync.com lets you turn synchronization off for specific folders. That’s good, because you wouldn’t be saving hard drive space owing to the fact that synced files are stored both in the cloud and on your hard drive. This feature is called selective sync. The only issue we have with Sync.com’s approach to selective sync is that the client is a bit plain and folder names are pushed together too closely vertically, which is a bit hard to read (you can resize the window, but doing so doesn’t fix the issue). We didn’t notice any performance issues while undergoing our sync tests, but if that does become an issue, you can throttle sync speeds to make Sync.com more manageable. You can pick a hard cap like 1Mbps or you can choose “automatic,” the default option. There’s no option for unlimited bandwidth usage, meaning there’s always a chance of synchronization slowing down regardless of whether you’ve got a cap set. Many other cloud storage tools include an “unlimited option,” and Sync.com should, too. Like the selective sync controls, the throttle options are bit hard to read, too. A desktop client makeover would be much appreciated. Generally speaking though, Sync.com moves files efficiently. We’ve never encountered any troubles with it, despite having tested the service often over the past few years. The speeds were quite a bit worse than those posted by Sync.com. That result is maybe somewhat surprising since MEGA has data centers around the world, while Sync.com’s only in Canada. While we were working with a pretty big file set, we expected better. Other MEGA users have reported sluggish speeds. We’ve also heard reports of files failing to upload, too, but didn’t experience that particular problem. MEGA has selective sync, but its strangely implemented. When you first sign into the desktop client, you’ll be give the choice of full or selective sync. Strangely, there doesn’t seem to be a way to set selective sync later if you go with a full sync. There is an option to throttle sync speeds, which you find in the bandwidth tab of the settings window. Like Sync.com, MEGA lets you throttle sync speed. Unlike Sync.com, you can tell MEGA to not limit sync speeds at all, though the default is automatic throttle for file uploads. Or, you can set any hard cap you want. The results of our sync speed tests favored Sync.com by quite a bit. Moreover, Sync.com doesn’t seem to attract the same caliber of reliability complaints that MEGA does. While the MEGA desktop client looks nicer than what the developers at Sync.com have put together, setting up selective sync with MEGA is a much more confusing process. The main issue we have with Sync.com is that you can’t tell it to not limit bandwidth. Add up the results, and the victor of this round is clear. Both Sync.com and MEGA let you share files with others, an obvious extension of cloud storage. The approach both take is to generate links that let others download your files or access folders. However, as we’ll see in round three, there’s much more to it than that. Sync.com lets you create a link to share files directly from your file system by right-clicking on any file and selecting “create a link.” Doing so will copy the link to your clipboard. There’s also an option for “manage link” once one is created, but this will just take you online to the Sync.com web interface. Sharing links from the website is much more easy, to be honest. Each folder and file has a share button attached to it. Click this button to share your content and a window will open up with a few options. At the top, you’ll see a unique link. This link lets others download files that you’ve stored in the cloud. You can copy the link to share, or you can add email addresses for recipients. There’s also an option below the file link to change your link settings. Sync.com gets this part right by letting you set both link passwords and expiry dates. Doing so helps prevent unauthorized link use. While such precautions might seem like a no-brainer, many cloud storage services don’t bother and some, like Dropbox, charge extra (check out our Dropbox review for more on this). You can also set download limits for links and receive notifications of link activity. Sync.com is also one of the few zero-knowledge services we know of that extends that security to shared files, which it calls “enhanced security.” We’ll talk more about encryption in the next round. With folders, you can generate a link or select an option called “collaborate with others.” Collaborate lets you invite others to access your folders and give them access permissions. When you share a folder via link with Sync.com, those you’ve shared it with can download individual files within it or all at once as a zip file. The .zip file addition is a new feature, and one that’s much appreciated. Sync.com also lets you request files by generating an upload link for a specified folder. Finally, browser tabs for “links” and “shares” let you quickly audit what content you’re sharing, change link settings and deactive links. The basic approach to file sharing with MEGA runs a lot like Sync.com. Within the MEGA sync folder, you can right-click on on any file and select “get MEGA link” to generate a link that’s saved to your clipboard. Or, you can log into the MEGA web UI and do the same thing. Doing so from the browser gives you more options, so that’s probably the better way to do it. Those include the abilities to generate a link with or without an encryption key embedded in it. Sending a link with the key attached means that anybody with that link can access your file. Sending the key without the link attached lets you distribute the key separately, ideally in a secure channel. In this way, the key is like a password. If you’re a subscriber, you can also add passwords and expiry dates to links. Again, those are steps many cloud storage services don’t take, so kudos to MEGA here. Even better, file sharing with MEGA retains zero-knowledge knowledge encryption. As mentioned, get into what that means in our security round. There’s no option to send the link to specific email addresses, but that’s more of a minor inconvenience since you an just copy and paste the link in the email body yourself. When you share a folder, there is a “sharing” option, though, that does let you input email addresses. Each email address can be assigned folder permissions, which include read, read/write and full access. MEGA doesn’t let you set link activity notifications or set download limits. There’s also no “shared” tab to audit what links you’ve created, all of which can lead to problems if you’re not careful. There is, however, a “shared with me” tab to access content other MEGA users have given you access to. MEGA does many good things when it comes to file sharing: it retains zero-knowledge encryption on file shares, lets you set password and expiry dates, and set folder permissions. For all the good it does, MEGA has a few glaring misses like no link activity notifications and no way to quickly audit shared folders and files. Not only does Sync.com not share the same failings, it has several other excellent share features like the ability to generate upload links. Cloud security is always a topic of concern when comparing cloud storage services. In this case, it’s a particularly interesting comparison since Sync.com and MEGA are two of the most popular zero-knowledge cloud storage services available. Zero-knowledge encryption is a more marketable way of saying private end-to-end encryption. The advantage is that you get to hold onto your encryption keys yourself; the cloud storage company doesn’t keep copies. That means that nobody but you and those you grant access can ever decrypt your files. Sync.com encrypts files using AES 256-bit encryption. Files in transit are further protected with TLS tunnels and the encryption keys protected using 2048-bit RSA. This helps fend off man-in-the-middle attacks and other types of online eavesdropping. All of that is pretty common, though. What separates Sync.com from most mainstream cloud storage services is the fact that not only are files encrypted in transit and at rest, they never get decrypted from the time they leave your computer to the time you access them again. Only you can decrypt your files. While encryption keys are next to impossible to crack, the same can’t be said of terrible passwords. A 256-bit encryption key could theoretically take billions of years to brute-force crack. Weak passwords can be undone in a few hours. The best thing you can do to prevent that from happening is make sure you use a strong password. However, Sync.com helps out, too, with an option to activate two-factor authentication (2FA). With 2FA on, your password alone won’t be enough to access your account from a machine that Sync.com doesn’t recognized. Logging in under such conditions will require a special security code sent to your email address or mobile device (using Google Authenticator). Sync.com also maintains a hardened datacenter that is SOC-1 certified. It’s built to withstand natural disasters and guard against both physical and online attacks. The Sync.com datacenter is also located in Toronto, Canada. The advantage of that is that Canada has generally more privacy-friendly laws than the U.S., where most other cloud storage services are located. Finally, we’ll point out that Sync.com lets you revert to previous versions of files. While this feature might be more commonly used to rollback unwanted file changes, it can also be used to undo corruptions caused by malware, including ransomware. Sync.com actually maintains unlimited versions, which don’t cut into your cloud storage space. It’s one of the few cloud storage service that doesn’t impose limits or delete old versions over time. MEGA ia a zero-knowledge cloud storage service, just like Sync.com. As noted, it extends this level of encryption to file shares, too. MEGA also uses the AES protocol to scramble files, although the actual level of encryption, 128-bit, is a weaker than that used by Sync.com. However, don’t let that sway you. AES 128. Like AES 128, isn’t known to have been cracked and, in fact, its believed it would take a supercomputer billions of years to do so, although quantum computing could shrink that number in the near future. AES 128 also has the advantage of less CPU strain than AES 256. In-transit protections are in place with MEGA, using the expected approach of TLS for secure connections. MEGA doesn’t have an option for two-factor authentication, which is a problem that somewhat undoes the advantage of zero-knowledge. Make sure you come up with a good password and it’s not one you use elsewhere if you store confidential information with MEGA. MEGA servers are located in Luxembourg, Germany, France, the Netherlands, Canada and New Zealand, where the company is headquartered. Privacy is considered a fundamental human right in New Zealand, and privacy laws in the EU and Canada are likewise strong. MEGA does not support file versioning, which is a fact that surprises us all over again each time we learn it. That makes it absolutely worthless against file corruptions caused by online attacks. The zero-knowledge fraternity is a small one with cloud storage, and doesn’t include the likes of Dropbox, Google Drive or OneDrive. Owing to that, it shouldn’t come as a surprise that Sync.com and MEGA both rank in our best zero-knowledge cloud storage review. We’re giving the nod to Sync.com, however, based on two very important considerations: two-factor authentication and unlimited versioning history. Not only does MEGA not include 2FA, the service maintain any old file versions. Sync.com also takes a more secure approach to file sharing. Yes, we discussed that in the previous round, but we suddenly felt like piling on. Four rounds. Four wins for Sync.com. Sync.com has thoroughly trounced MEGA. Okay, so there were more than a few aspects of cloud storage that we didn’t get into. For example, we didn’t talk about platform support, which may have gone MEGA’s way based on the fact that it has a Linux client and Sync.com does not. (Read our best cloud storage for Linux article for more on this). We also didn’t talk support, which would have gone to Sync.com based on the fact that MEGA often takes several days to reply to our emails while Sync.com usually gets back to us in a few hours on weekdays. No matter how we spin it, though, we just can’t envision a comparison in which MEGA ultimately outduels Sync.com as the better service. MEGA isn’t completely alone there, as Sync.com ofte comes out on top. However, with pCloud, Dropbox, Google Drive, OneDrive and even iCloud, we can imagine multiple use cases where one of those services would beat Sync.com. The only thing MEGA really has going for it over Sync.com is 50GB of free cloud storage. In short, MEGA is the best cloud storage for people looking to get free storage (not that there’s anything wrong with that) and not really anything else. Have your own opinion? Sure you do! Let us know know in the comments below. What a nonsense. Mega is so much better than described in this article. I’m sure you get paid to promote sync.com. But if you want to store your important stuff secure and safe and without people scanning your files, you should definitely pick mega. I guess since they have more users, it is more likely to find a match.